Melbourne has enough family entertainment to keep the kids captivated but make your holiday memorable on an escape from the city. 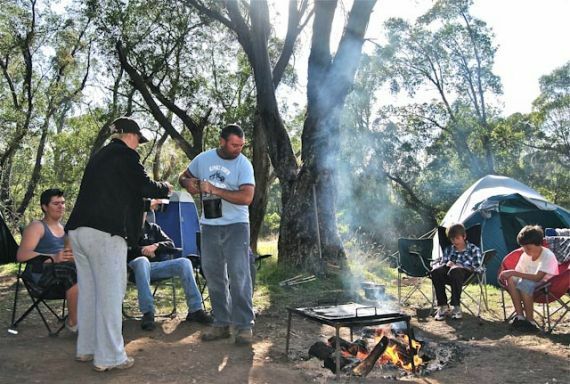 Victoria has hundreds of camping sites, with over 40 million visitors to national parks in the state every year. 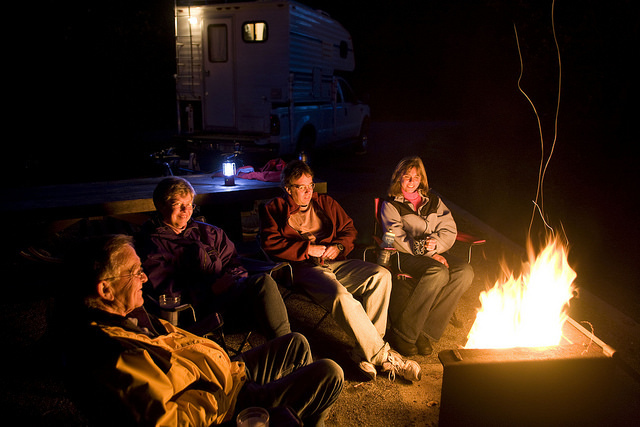 Choose from the best camping spots for families with this top 5 list in Vic. At the southernmost point of our state, Wilsons Promontory is just past Foster on the 3-hour drive southeast from Melbourne on the South Gippsland Hwy. Once you've pitched your tent, you could spend days hiking the area and never walk the same trail twice. Choose from over a dozen short walks through rainforest, along beaches and ascending mini-mountains. One of the longest is 3 hours, in a loop through the rainforest in Lilly Pilly Gully to climb above trees atop Mt. Bishop. A mobility-friendly alternative is the amusingly named Loo-Errn Track, entering the wetlands around the Tidal River. You could tip your toes in the water from the boardwalk or download the ClimateWatch app to record sightings of native species. Your citizen science helps scientists and rangers protect the biodiversity of the park. During the day, you'll see kangaroos and wombats, wading birds and seabirds, and as the sun sets, you may spot an Eastern Pygmy-possum or Feather-tailed Glider in the woodlands. The sea can be a bit treacherous, so stick to the sheltered western side of the park for swimming, starting with the beach at Norman Bay. If you're boating or canoeing, bring your snorkel or scuba gear to discover the underwater wildlife in the marine NP. Much of the eastern and southern coast of the park is a marine protected area but at Squeaky Beach, you can wade into the ocean to fish for salmon and flathead. Check the current restrictions at the visitor's centre before casting your hook. Stock up on supplies at the park's general store or grab takeaway fish and chips for dinner if the fish weren't biting. The Tidal River campground is large enough to handle almost 500 campsites. It's comfortable for first-timers, with hot showers, laundry, toilets. You can also cook on the free gas barbecues. If you're looking for a quick outdoor holiday but don't have the tent or caravan yet, you can book huts nearby. There are apartments, cabins and glamping safari tents but you'll lose brownie points with your camping friends for choosing those luxury options. The Tidal River site is so popular during the Dec/Jan school holidays that a ballot opens in June. Mark it on your calendar if you're planning a peak season holiday. Prices start at $58 for a family of 4 to camp at Tidal River. For more info and to book, visit the Parks Victoria website. Pack the car for the 3-hour trip west on the Western Freeway, passing through Ballarat. The Grampians are one of our most popular holiday spots, and you'll find cultural and natural treats during your camping adventure. In the national park, the sawmill has long since closed, replaced with this campsite near Mackenzie Falls. Start in the ancient past with a cultural hike through stringybark forest to visit Aboriginal shelters, with rock art carved into the sandstone cliffs. If you've got gold fever, hike the Mafeking heritage walk to see remains of mines from the gold rush of the 1850s and 60s. The walk also leads to the Heatherlie Quarry, once used to extract the sandstone for Melbourne's heritage-listed buildings. In the north of the park, there are 8 separate walking tracks, the longest needing only 3 hours to complete. Listen for the rustling of emus, black wallabies and possums on your hike. 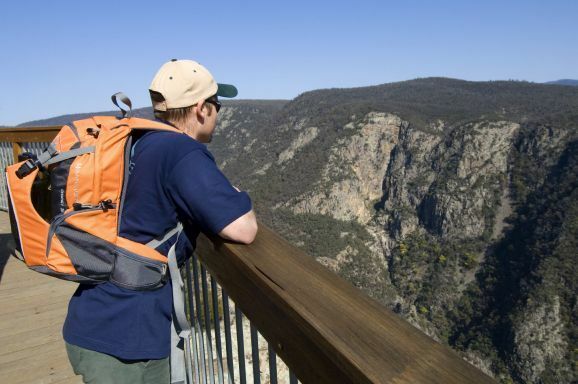 Perch on the Bluff Lookout at MacKenzie Falls and then plunge deep into the gorge during the 7km, 3hr river walk. At the base of the gorge, you can stand beneath the plunging water from the falls as it crashes into the river. To reach the summit of the region, start in the Hollow Mountain carpark, ascending past sheer cliffs to catch your breath with a view of pine and eucalypt trees in the Stapylton amphitheatre. During spring, you'll be greeted with the bright colouring of wildflowers and the soothing scents of native herbs. Smiths is a smaller campground, with less than 30 sites. It has toilets, showers, fireplaces and picnic tables. You can use the river-fed taps for washing, but bring your own drinking water. Prices start at $28 for a family to camp at Smiths Mill. For more info and to book, visit the Parks Victoria website. Johanna Beach, in the Great Otway National Park, is only 3 hours southwest on the Monash Freeway, passing Geelong and Colac. The campground is named for the shipwreck of 1843, when the Joanna was swept into the coast and sank. The survivors were the first Europeans to trek through the region, misspelling the name of the beach in their haste. The sailors of the Joanna were not the last to strike land, with the iron anchors of two other 19th century ships still rusting at Wreck Beach. To prevent further tragedy, one of Australia's earliest lighthouses was erected near Johanna Beach. You can visit Cape Otway Lightstation on a guided tour. Other tours in the park feature Koori culture and food, and the signs of prehistoric animals, including polar dinosaurs from 120 million years ago. While the swells are challenging for large ships, they can be ideal for surfing. There are also calmer spots and rockpools in the bay for swimming. Bring your fishing gear to catch whiting, salmon and snapper from the rocks and beaches. Hikers can tackle part of the 100km Great Ocean Walk, either east to Castle Cove or west to Milanesia Beach and beyond (if you reach the Twelve Apostles, stop! - you've reached the finish line, earning a break to admire the view). You can hike or cycle beneath towering beech, blackwood and ash trees on the 45km Old Beechy Rail Trail in Beech Forest. When the stars are out, try to catch a glimpse of the glowing eyes of spot-tailed quolls, possums and wallabies. The campsite is one of the few allowing pet dogs, but ensure they are kept on a leash. There are toilets and picnic tables but bring drinking water and a gas or stove for cooking. Prices start at $28 for a family to camp at Joanna Beach. Book your spot at the Parks Victoria website. On a longer trip for a camping holiday, share the driving for the 5.5-hour journey east, turning north until you're within 25km of the NSW border. McKillops Bridge is in the northern tip of the Snowy River National Park, just off McKillops Rd. It's beside the northern banks of the Snowy River, giving easy access for boating trailers to the water. For children in their mid to late teens, the canoeing and hiking will be a family adventure. With a seasoned paddler in the group, you could spend 4 days traversing the whitewater rapids on a rafting trip, setting up camp along the way on the sand bars. If you're new to whitewater rafting, learn the basics with a 'come and try' day or short course on the Yarra with Canoeing Victoria. On the first day, start with an easy hike leading to a breathtaking reward. Follow the signs westward from Bonang-Gelantip Rd to reach the lookout above Victoria's deepest gorge, Little River Gorge. If your kids are savvy orienteers, cross the Snowy on the short stroll south to begin a 15km loop to abandoned silver mines. Pack a hiking map and compass with your food, first aid and wet weather gear. Before setting out, read the Silver Mine Walk visitor guide. Along the way, scan for signs of regrowth in the grassy woodlands as almost 1000 native plant species replace blackened ash with bright green shoots. As you venture further south into the ancient alpine ash forests, the tree branches above you will flash with brilliant blues as azure kingfishers dart between them. At ground level, focus on the tiny movements in the undergrowth that reveal endangered native animals, including giant burrowing frogs and long-footed potoroos (rabbit-sized marsupials that resemble tiny kangaroos). McKillops Bridge campsite has toilets, picnic tables and fireplaces, but bring your own firewood, stove and drinking water. It is also free to camp in, with no bookings needed (first come, first served). For more info, visit the Parks Victoria website. To reach the Alpine National Park, drive east for 5 hours on the Monash Freeway, skirting the southern edge of the Yarra Ranges before veering north at Glengarry. In Australia's alpine wonderland, the resorts are packed with cross-country skiers in winter, but you can canoe, cycle and ride horses in the warmer months. Pitch your tent beneath tall eucalypt trees, or Black Sallees, distinctive for the tanned tree bark and aromatic leaves, perfect to whistle up a tune. Horseyard Flat is set in the south of the park, between Moroka River and Pinnacles Rd. The park is vast and there are over two dozen outdoor activities to keep you busy. To get a headstart, you can arrange a tour, with experts providing guidance and equipment for horse riding, rock climbing, abseiling, canoeing and trail bike riding. Book a tour for your bucket list adventure here. Earn your hiking merit badge on the 14km 6-hour First Falls and Moroka Gorge Hike. You'll trek through woodland and wetland, following the river to cool off at First Falls with a swim in the rockpools. For the experienced hiker, continue on the unmarked trail for a challenging ascent through the alpine region. As you explore the park, you'll encounter a dozen native plant species, unique to the region after adapting to the winter snowfalls. The striking white petals of Bogong and Silky Daisy-bushes hint at the snowflakes that coat the forest in winter. Tread carefully to see the tiny Mountain Pygmy-possum, a marsupial unique in the world as it lives only in alpine regions. The bogong moth invades cities, fluttering into bright lights and frustrating politicians. See them in their natural habitat in summer, tucked into rock crevices. At Horseyard Flat, there are toilets, a fireplace and picnic tables. For a fresh dinner, you can catch brown trout in the river. You can also bring a camper instead of tents. It is another free campsite, with no bookings needed (first come, first served). Check for signs to confirm the boundary of the campground and whether campfires are permitted. To avoid clashes with native wildlife, pets usually aren't allowed in national parks. Leave your pet with a friend during your camping holiday. Take selfies near-native animals but don't disturb or feed them. Keep your food in containers between meals. Download the Triple Zero smartphone app for info and contact numbers in emergency and non-emergency situations. The app also gives GPS coordinates to read to the emergency operator. Before swimming, check the conditions, especially the speed and depth of rivers. Don't swim alone. A friend on the riverbank can use a rope or stick to reach you. Buy a Victorian recreational fishing licence if you're fishing in fresh and salt waters. There are options for a long weekend (only $7), and up to 3 years for $85. You can pay the fee here. To avoid camping fees, try these top 5 free campsites in Victoria. Where do you love to go camping with the family? Please leave a comment. We'd love to hear your ideas.